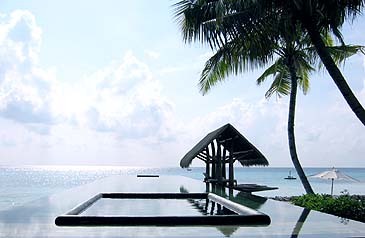 Maldives, officially the Republic of Maldives, is an island nation consisting of scores of atolls in the Indian Ocean. "The pearl necklace of the Indian Ocean" is located south of India's Lakshadweep islands, and about 700 km south-west of Sri Lanka. Maldives means "Mountain Islands." The 2nd Maldives Mr. & Miss Beauty Contest, sponsered by Maldives National Administration of Tourism and superintended by Chundo Travel Co. and "XTM," starts recruiting candidates in South Korea on Feb. 15, 2007. Main contest will be held in Maldives on May 8-22, 2007. The Maldives Mr. & Miss Beauty Contest is an anual event to choose nongovernmental ambassadors who will promote the breath-taking tourist attractions of Maldives which started in 2006. All participants should be unmarried, be graduated from highschool, at the age 18 to 32, and have citizenship of Republic of Korea. The total prizes of this contest is up to 4400,000 won. and experience significant culture and beautiful tourist attraction of Maldives. Especially The main contestant of this contest will have a chance to participate in producing TV programs of XTM (www.xtmtv.com). and the On-line recruiting will be closed by the 31st of March. Inquiry & Guidance: Mr. Han Kyu-Ho of Seoul brach office of Maldives Tourist Bureau at 02-320-4332.